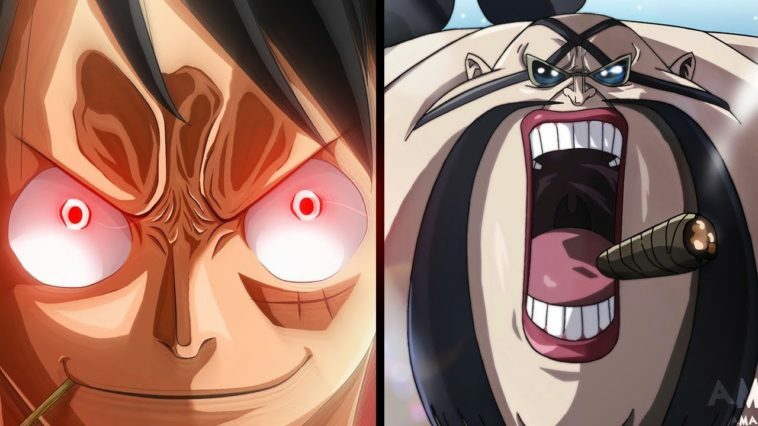 Home Anime Luffy unleash his incredible Conqueror’s Haki in Wano! 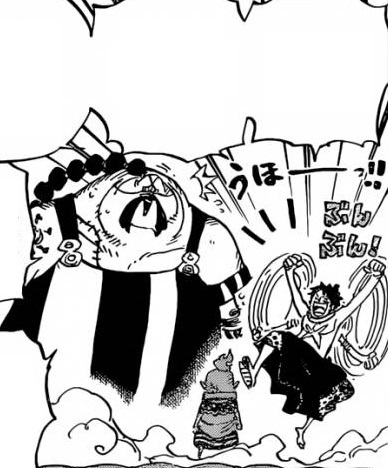 Queen puts Luffy and Hyogoro into a sumo death match against him and his subordinates, and the two of them will be instantly killed by special collars if they get knocked out of the ring. There is no limit to the number of fighters Queen can put in a match, or the weapons they can use. As an act of mercy, Queen removes their seastone handcuffs. 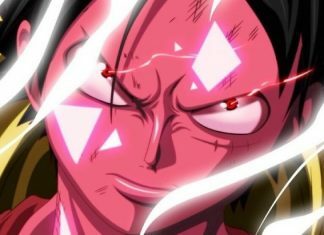 However, Luffy can opt out of the execution right now if he chooses to join Kaido’s crew. Queen’s men are eager to start fighting. The crowd starts cheering as Queen begins the match. A female Beast Pirates member gives the signal to start and the fighters charge at Luffy, weapons drawn. Luffy only grins as he unleashes a burst of Haoshoku Haki(Conqueror’s Haki), knocking out every fighter. Unimpressed, Luffy calls for the next round. 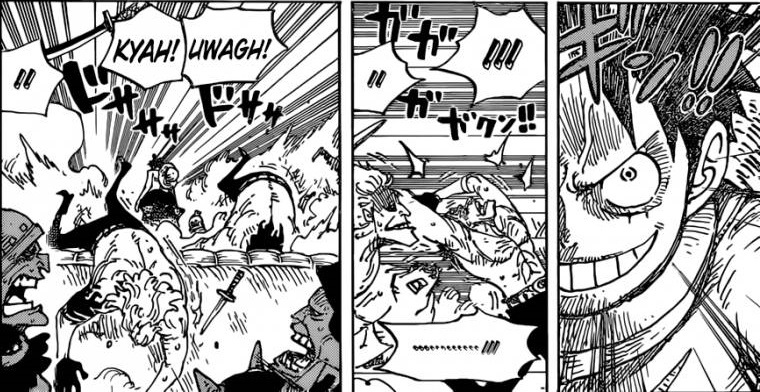 Everyone is stunned, while Queen is amused by Luffy’s ability to use Haoshoku Haki. In his cell, Kawamatsu muses about how noisy things have gotten since Luffy showed up and prays that he makes sure Hyogoro doesn’t die. Meanwhile, Drake and Hawkins’ platoon raids the Flower Capital bathhouse to arrest anyone with a crescent moon symbol on their ankle. 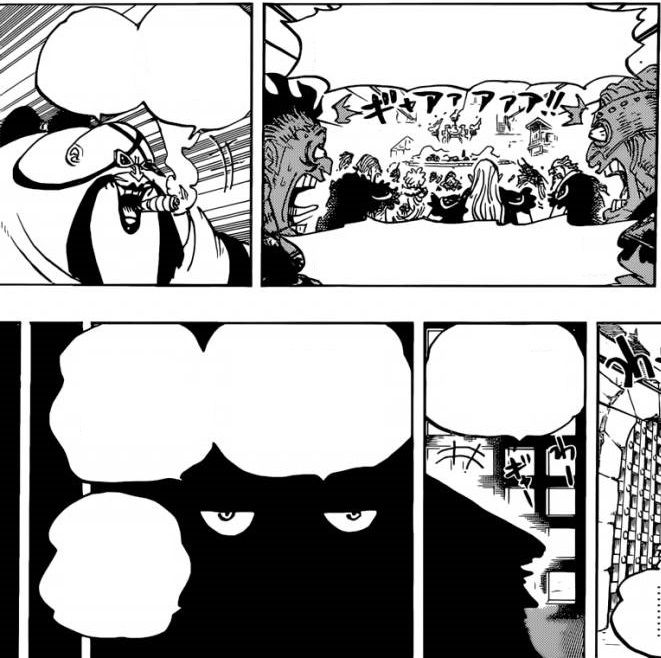 Sanji inadvertently reveals his presence in his Raid Suit, and escapes with Nami, Robin, and Shinobu. 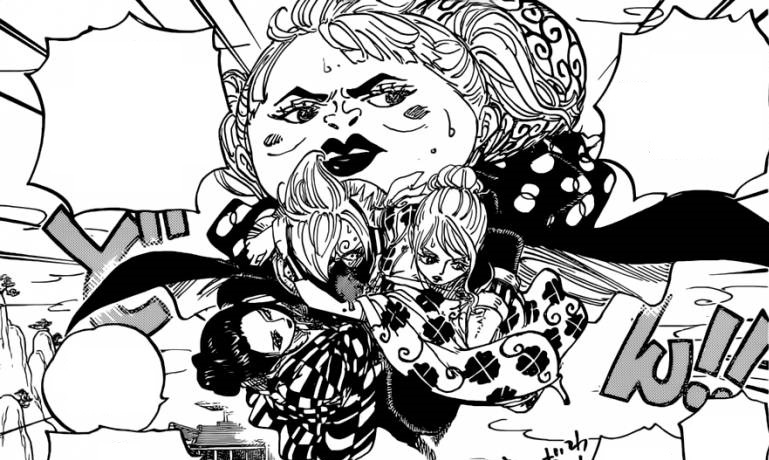 He reveals to them that the Heart Pirates were captured, and that they need to tell Law before he is lured to his crewmates. 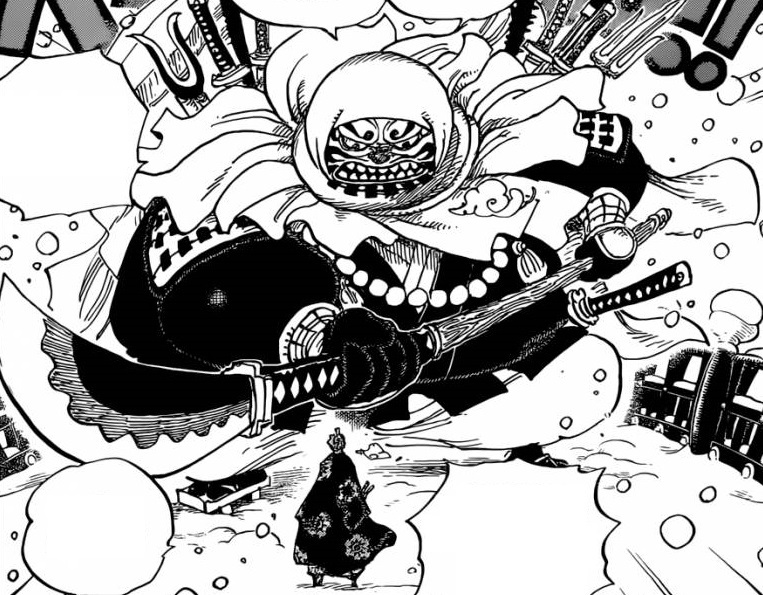 Meanwhile, Zoro chases the man who stole Shusui to Ringo, and the man reveals that he returned it to Ryuma’s grave as the two prepare to fight for the weapons in each other’s possession.